Tyrone will host Fermanagh at Healy Park, Omagh on Wednesday evening at they start their Ulster U21 Football title bid. After winning the Shamrock Cup in February, defeating Monaghan 1-10 to 0-10, the Red Hands will be full of confidence going into the Erne clash. Tyrone have a formidable history at U21s but Cavan have recently overtake them as dominant force, the Breffni side dumping Tyrone out in three of the last four seasons. Manager Feargal Logan stressed the importance of re-establishing Tyrone as the top county. Assisted by a wealth of knowledge and experience in the backroom, most notably Peter Canavan, Brian Dooher and John Devine. “They sweated blood to get Tyrone to the top of inter county football and now want see the next generation through. With no back door, the competition is squeezed in, but it is very important in developing the next generation of senior footballers” says Logan. Cathal McShane, playing well in the senior side, will lead the charge and Mark Bradley, who debuted in Dublin, and Trillick’s Lee Brennan should all cause problems for Fermanagh. Elswhere, Kieran McGeary, Ruairi Brennan and Peter McKenna among others will be hoping to carry the good early season form into the championship where it matters. Fermanagh boast several of their own players on their senior panel, namely James McMahon, James Allen, Eddie Courtney and Eoin McManus. They will also be keen to put in a big performance and take a place in the semi-finals. 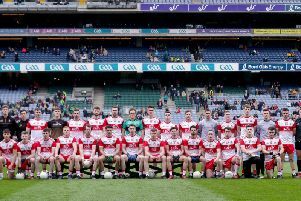 Tyrone early season success and home advantage will see them enter the game as favourites, and they should have too much firepower in their ranks to beat Fermanagh and advance.